Friends. Cestrians. Countrymen. Lend me your eyeballs for another James Wright review for We Are Chester. Photos by Mark Carline. This time around, I found myself making my way into Storyhouse in the heart of our fair city for the very first time – something that I’m afraid to admit considering how wonderful and impressive I found the whole venue. Seriously, if you have not yet been in there for a theatre performance, to watch a movie, grab a drink, or even just read a book in their library, I urge you to do so at your earliest convenience. Speaking of convenience, demonstrating their forward thinking nature, Storyhouse features gender neutral toilets. They really do cater for everyone! 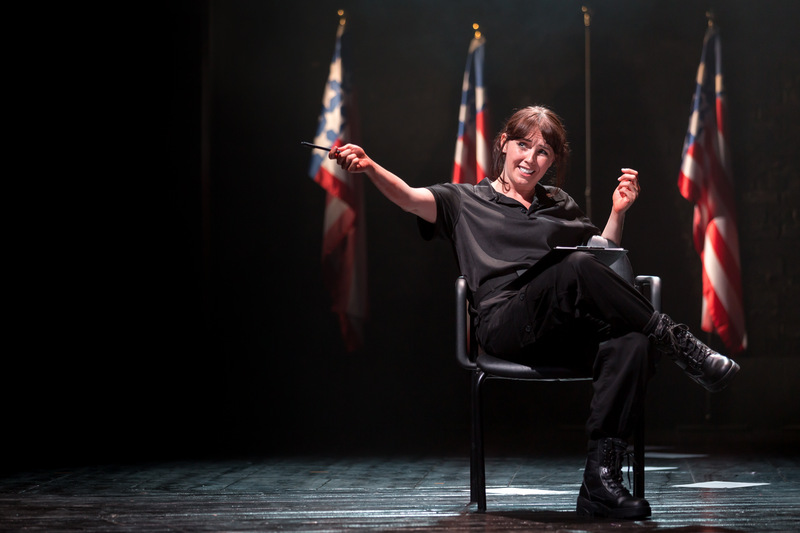 So, as some of you may have gathered from the opening line to this review, I go to see the talented performers at Storyhouse act out one of William Shakespeare’s political plays, Julius Caesar. Having no idea about the events that will take place within this performance, I am able to walk into this with a fresh, virgin mind. Not that that should, or would, affect your appreciation of this, of course. The crew at Storyhouse, dotted around the foyer, are exceptionally helpful and pleasant, and as the mob of audience members grows, we all wait patiently for the play to begin. In a change of pace from other plays and even other theatres, Storyhouse starts off their performance right there in the foyer where we had just moments previously finished our pre-show drinks. If you have seen Julius Caesar before, you’ll probably have seen it in more…traditional garb – the Romans in togas, the swords are swords, the usual scene. With Storyhouse however, the cast and crew give the political thriller a modern, contemporary feel and look. They’ve made Emperor Caesar into a faux-Presidential candidate, complete with security team marching ahead of him through the foyer and a dedicated rabble of working class members of Rome with signs reading ‘Make Rome great again’ – wonder where they got that from? My partner, who herself is quite the Shakespearean fan, is in tears watching this opening scene – a bit overwhelmed bless her. However, that surely shows you all the sort of performance you can expect from Storyhouse. From this opening scene, we are lead into the main theatre room, which reminds me of the Grosvenor Park Open Air Theatre in Chester (which will also be showcasing Julius Caesar from 3 August, by the way), horseshoed around the stage, with the action emanating from the centre outwards, as all good plays should be, of course. The first half plays out, and without ruining too much of the narrative for any fellow Caesar-virgins, the penultimate scene of the first half sees a great visual play out – one of the best of the play in fact. It’s hard not to get invested throughout the whole play leading up to this moment and the subsequent pay-off and fall-out leading us into the second half. The contemporary setting is never as prevalent than in the second half, as the two warring sides – Mark Antony (Natalie Grady) on one side and Brutus/Cassius (Richard Pepper and Christopher Staines respectively) – don contemporary costumes in their war against one another. Mark Antony’s army looks akin to SWAT team members or armoured police officers, some complete with balaclavas, and Brutus/Cassius’ forces were decked out in camouflage army uniform, complete with AK-47s and other assault rifles. The costuming is one element of a play, but of course, the main appeal is the level of acting on display, and Storyhouse delivered throughout. With a play lasting three hours or as near as makes no difference, it’s a hard slog to get through for the cast and crew, but no-one faltered and the play went from strength-to-strength. Christopher Wright, who plays Caesar, captures the frame and dignity of the famous Emperor whilst also portraying the controversial nature of the character. The aforementioned Richard Pepper, who portrays Brutus, delivers a stirring performance and rallying rhetoric that makes it easy to get behind him as a character and as a figurehead. Added to all that, there’s the musical score (Tayo Akinbode) which is atmospheric and emotive. So much so, that without the added musical impact, some of the scenes just wouldn’t have the same impact. If you have never been to Storyhouse, this is a perfect reason to do so. If you’re a regular to Storyhouse, then that’s even better as you’ll know what to expect. This performance, directed by Loveday Ingram, really is the kind of quality that would not look out of place at the RSC. Be warned though, that the play does run for almost three whole hours with a 20-minute interval, so don’t make too many plans for afterwards. There’s plenty to laugh at, feel shocked at, and generally enjoy from this production, and as the weather (hopefully) starts to get warmer again, you’ll have the added opportunity of watching it in the Grosvenor Park Open Air Theatre. Tickets can be purchased here, or by contacting the booking office on 08448157202. Julius Caesar is running until 30 July in Storyhouse before moving to the Grosvenor Open Air Theatre from 3 August until 27 August. Catch it whilst you can.